Morocco’s trade balance has improved substantially in recent years and is set to perform better still in the upcoming years thanks to factors such as lower oil prices and improving conditions in major export markets. Exports in recent years were worth 21.8 billion Euros, while the value of imports stood at more than 20.2 billion Euros. Despite the slow recovery of the international economy, trade between Morocco and sub-Saharan Africa has been on an upward trend since 2009, with an annual growth of 12.8% between 2000 and 2015. Another positive trend is the increase in the number of products that Morocco exports to sub-Saharan Africa: the Kingdom now exports about 187 products compared to only 83 products in 1995. From a continental perspective, over two-thirds (68.3%) of Moroccan exports by value were delivered to European countries while 12.5% were sold to importers in Asia. China with 7% and Saudi Arabia with 6,5% followed by the USA at 6,1% are the next in line. Taking these developments into account, the volume of foreign demand addressed to Morocco should benefit from the upturn of the international economy, and have grown by 4.5% in 2017 and 4.1% in 2018 after 3.1% in 2016, according to the latest data on import forecasts of Morocco's main partners. Morocco has thus witnessed an increase in the rate of openness of its economy from 49% in 2000 to 62.2% in 2016. Compared to other emerging countries, our country has achieved an average opening rate of 62% over the period 2008-2016, which is higher than South Africa (57%), Turkey (42%) and Brazil (19%). However, it remains lower than Malaysia (135%), Tunisia (87%) and Poland (76%). 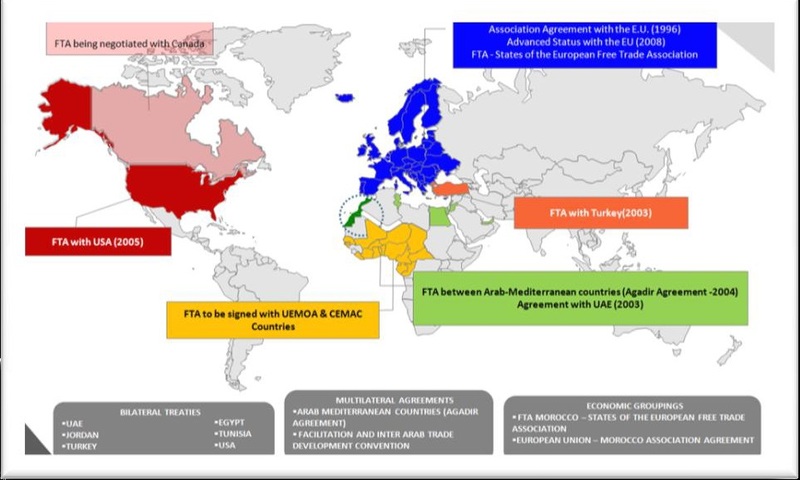 The European Union is by far Morocco’s largest and most significant trading partner, accounting for more than 50% of the Kingdom’s total external trade. Taking individual countries into account, France was the largest exporter to Morocco in the last years with 15 billion dollars approximately, followed by Spain at 14.32 billion dollars. Both countries represent equally the largest export markets for Morocco. Besides, Morocco succeeded all over the last decade to position itself as a hub for trade and investment in the African continent. This regional ambition is embodied with projects such as the Tanger-Med Port and Casablanca Finance City, a hub for international companies wishing to invest in Africa. Morocco has been ranked as the third largest recipient of Foreign Direct Investment (FDI) in Africa. Investors are attracted by the country’s stability, the availability of skilled labor at comparatively lower wages, the proximity to European and African Markets, and the access to other markets via free trade agreements. Morocco’s expanding international engagement is reflected by a rise in FDI. Whereas in the 1990’s, Morocco attracted an average of 500 million USD of FDI annually, it has attracted more than 3 billion USD annually, in recent years. Moreover, many institutional and legislative reforms have been introduced in order to attract more Foreign Direct Investments for Morocco. Tax breaks have drawn a splurge of foreign investors, including 110 aerospace firms and 150 automotive companies. Morocco attracted regular inflows of foreign capital, particularly in the banking, tourism and energy sectors, through the development of its industry. While the mining industry already plays an important role in Morocco’s economy, representing 25 percent of its exports, the national development strategy set out some lofty goals which include tripling non-phosphate revenues by the year 2025 and doubling jobs in the sector to over 30,000. Morocco holds three quarters of global phosphate reserves, and so the export of phosphate products has traditionally dominated the mining industry, comprising up to 90 percent of mining exports. Other minerals reserves abound (including lead, zinc, copper, manganese, gold, silver, iron ore and barite), but have remained largely underground, due partly to the success of the phosphate market which left them in its shadows. In order to attract investment for the development of all its mineral treasures, Morocco is making great strides in modernizing its mining sector, including the recent introduction of a new mining code. The new mining code introduces new types of mining authorizations, increases the term of a mining license to ten years and now covers all mineral substances with the exception of phosphates and construction materials.